Classroom waw wi the lyrics o İstiklal Marşı (far richt). 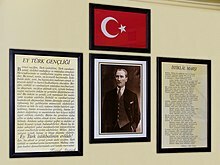 The İstiklâl marşı (Scots: Unthirldom hymn) is the naitional anthem o Turkey an Turkis Republic o Northren Cyprus, offeecially adoptit on 12 Mairch 1921 - twa an a hauf years afore the 29 October 1923 establishment o the Republic o Turkey, baith as a motivational muisical saga for the truips fichtin in the Turkis War o Unthirldom, an as an anthem for a Republic that wis yet tae be established. This page wis last eeditit on 4 October 2015, at 04:17.